If you love chicken pot pie, but don’t want to take the time to make a homemade pot pie crust, here is a gluten free chicken pot pie cheat! Creamy, thick chicken with leeks, carrots, sweet potatoes, and fresh thyme add a savory sweet flavor profile to this classic recipe. I am still in my comfort food zone. Fall is here, the kids are back in school…and the weather is finally cooling down. Hopefully, you are getting into your fall groove too! This is where I kick back and make easy comfort foods like my mom’s chicken pot pie. She makes it with a thick almost gravy-like sauce, and a flaky crust. Her chicken pot pie was perfect for family dinners. Unfortunately, I don’t have time during the school week to make her famous flaky crust. I just don’t. This is where Udi’s larger sized delicious Gluten Free Multigrain Bread comes in handy. Did you know this bread can make the perfect pot pie crust in just seconds?? Udi’s makes two super-sized gluten free breads, a soft white and a multigrain. This bread holds up to sandwiches and anything else you want…like these delicious Gluten Free Breakfast Pockets. Udi’s Gluten Free Bread holds up to baking into the gluten free chicken pot pie and makes a nice crispy topping for this pot pie recipe. Are you ready to see how easy this Gluten Free Chicken Pot Pie is to make? In a pan, add avocado oil, sweet potatoes, leeks, carrots, and garlic and sauté until the leeks are softened. Add the raw chicken breasts, spices and chicken broth to the pan. Cover and cook on medium-low heat until the chicken is cooked about 15 minutes. Remove the chicken breasts onto a cutting board. Use two forks to pull the chicken breasts apart. It should be very easy to shred the chicken. You can also buy shredding meat claws online if you prefer a wider surface for pulling chicken apart. Add the chicken back to the pot and add the flour and half and half. Stir to mix well. Preheat the oven to 350F degrees. Spray olive oil on a baking dish. Pour the chicken mixture into the dish. Let’s make the bread cut-outs. Chicken Pot Pie Crust Cheat! Press the cookie cutter down into the bread and remove the circles. What do I do with the extra bread? You can freeze the bread then use it to make bread pudding. Place the bread with the cut out onto a hot frying pan. Drop an egg into the middle and fry until the egg is cooked. It makes a fun surprise breakfast for kids!! Add the bread circles to the chicken pot pie mixture. Bake for 20 minutes at 350F degrees. A creamy gluten free pot pie that is ready quickly with this handy toast cheat. In a large pot, add the oil and chopped vegetables. Sauté on medium heat for 5 minutes. Add the chicken breasts, chicken broth, water, and spices. Cover and bring to a boil for 10 minutes. Remove the lid and remove the chicken to a cutting board. 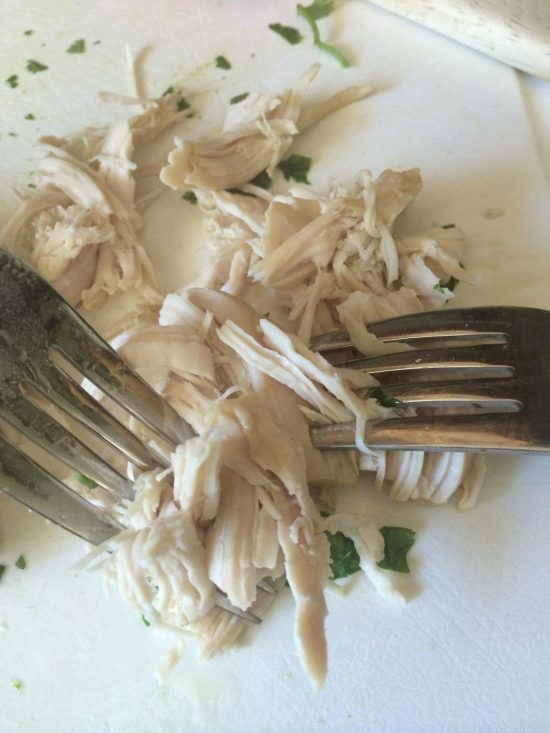 Use two forks to shred the chicken meat and put back into the pot. Add the gluten free flour and cream and stir to mix well. Pour the chicken mixture into a greased baking dish. Take the Udi's bread and use your favorite cookie cutter to cut out holes in the bread. Place the bread shapes onto the chicken pot pie filling. Bake for 15-20 minutes until bubbly. Ha, this is truly a time-saving way to make chicken pot pie! Although I only made the filling with the crust so far, yours looks pretty good with the sandwich bread! It’s totally worth trying. My daughter LOVES chicken pot pie and it’s one of those dishes I try to avoid making cos it always seems to be so labor intensive with the crust and all – so I am LOVING what you have done with Udi’s bread in this! Brilliant! Looks so delicious! I love how easy this is to make – perfect for dinner. Yes yes YES to the fall comfort food zone! I love the idea of a “cheaters” pot pie crust – I often use a sort of crumbled biscuit topping, and love the idea of this for a simple gluten-free option that still gives you that great crunch on top! Genius! Thank you so much Monica, I almost felt guilty telling everyone this cheat but it saves so much time! I have totally been craving chicken pot pie. It hasn’t even started cooling off here yet. It must just be my body sensing that fall is coming, so I’m craving ALL the comfort food. I can’t make my recipe on a weeknight because like you said, I just don’t have the time to make that crust. This is a great option! Thank you so much Lisa, I am glad this recipe will help on those busy nights. I love chicken pot pie! It would be so perfect for these rainy cooler days of fall. Even better that you were able to make this gluten free!